The Lion as Dexter Supporter is symbolic of the strength required in both the Blacksmith and his finished work. The Lion holds, in addition to the shield, a Crozier and a Hammer, being the traditional attributes of St Loye (the vernacular form of St Eligius – Bishop and Confessor and a Patron Saint of Blacksmiths). The Sinister Supporter is a Swan, symbolic of the grace and elegance so desirable in the finished work of the Blacksmith. Suspended from the neck of the Swan is an anchor – the traditional symbol of St Clement – a first century Bishop of Rome and a Martyr by having such an implement tied around his neck and being thrown in the sea. He is the “Old Clem” known to the Company and is a Patron of Blacksmiths. 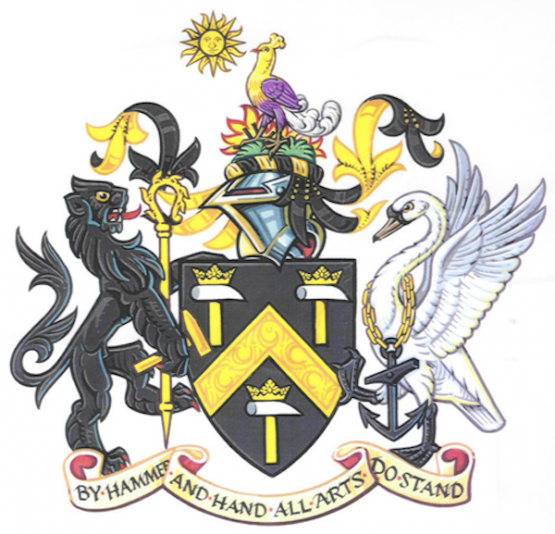 The Swan also comprises part of the crest of Past Prime Warden Dr Raymond Lister who was responsible for obtaining a Confirmation of the Arms and Crest as well as the Grant of Supporters by an exercise of the Royal Prerogative on behalf of the Company.